The 2-section Pacerpole has the same top section as the Alloy 3-section Pacerpole option .... but with an 80cm lower shaft section of Carbon Fibre. 1. It has only one Expanding bolt. 2. It is lighter than the 3-section Alloy Pacerpole. 3. It has a 10cm shaft-tip housing (instead of the 8cm tip housing of the 3-section Pacerpoles); this means that the threaded basket is higher off the ground - an advantage especially for those interested in extended snow use. 1. 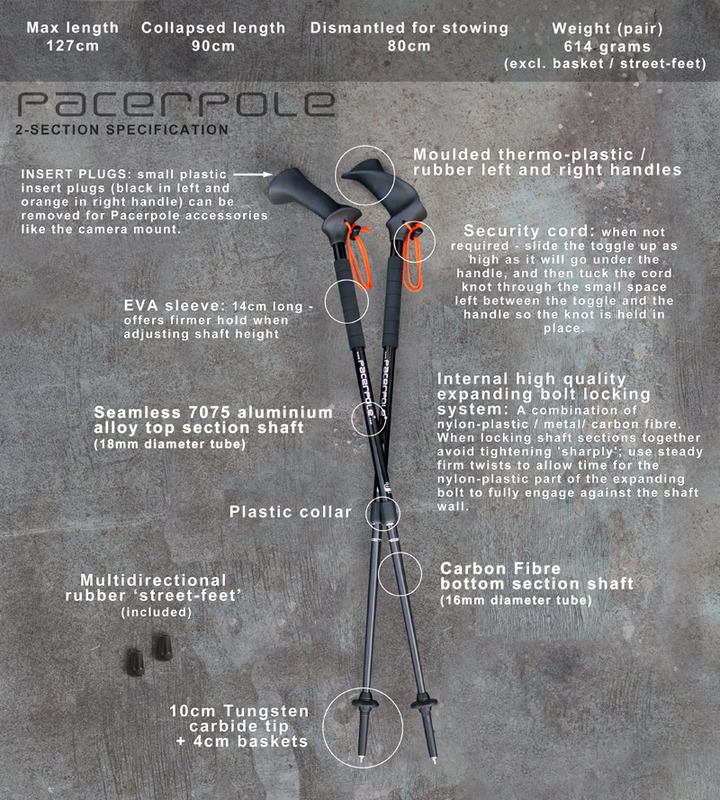 The lower shaft section is 16mm diameter and 80cm long, which makes it more difficult to stow (though Pacerpoles are designed to integrate with the user so that they can reinforce better body posture and walking performance constantly, whether walking on level ground or slopes ... so stowing may not be an issue as the poles could be in constant use). 2. For travelling, then any 'pac' or case would need to be at least 80cm as a diagonal corner-to-corner measurement. For general walking, continuous benefit from use of your Pacerpoles means that there are probably few occasions when they will need to be stowed i.e. where the 80cm length of the 2-section Pacerpole option would be a disadvantage. Similarly for fitness walkers to gain general health benefits - walking locally from their front door 2 or 3 times per week, where stowing the poles would not be an issue. Please note: the middle and bottom shaft sections of the 3-section Alloy Pacerpoles are together interchangeable with that of the single 80cm lower shaft section of the 2-section Pacerpole. **Remember to look after your pacerpoles.... click here for Care and Maintenance.